The new building is now completely enclosed, allowing interior work to proceed. The pouring of the concrete floors has begun and should be finished in about a week. 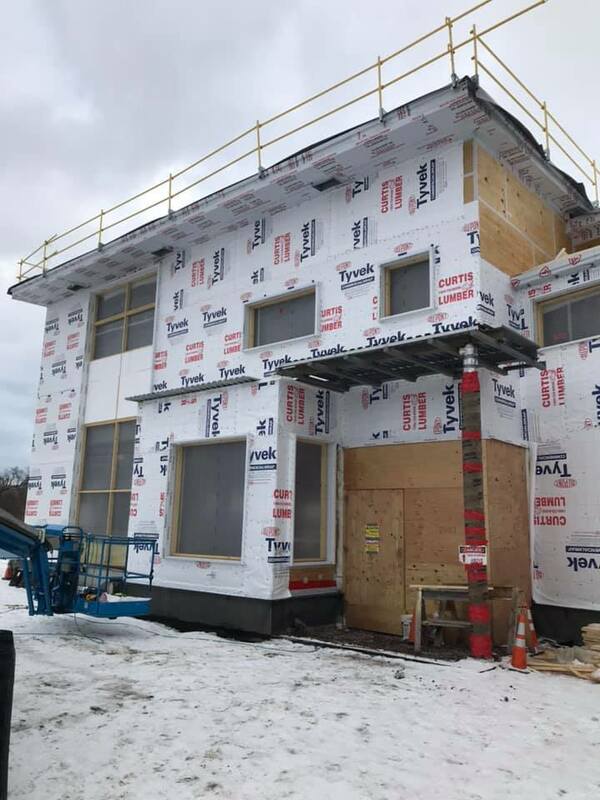 The first layer of sheathing of the building has been completed, to be followed by two layers of insulation, with the goal of installing the final layer of cladding in mid-March. The components of the new heating and cooling system are beginning to arrive and are being installed in the reworked (and dry!) mechanical room in Town Hall. The Lake Champlain Waldorf School’s upper level architecture class took a tour of the job site this month, asked wonderful questions, and provided great feedback to the design team regarding final finishes and furnishings for young adult areas. Many thanks to them and Ms. Sonn for their input and interest! The project committee is honored and humbled that Shelburne chose to dedicate this year’s town report to the fundraising volunteers and donors. Thank you for the time and treasure you have contributed!